Horses with congenital disorders are born with physical or physiological abnormalities. These may be readily apparent, or may be diagnosed as the foal matures. Unfortunately, the list of possible congenital deformities is long. These anomalies may affect the heart, ears, eyes or skin. The autoimmune, musculoskeletal, gastrointestinal and respiratory systems or the urogenital tract may be compromised. Let’s look at a few of the most common and concerning congenital defects and disorders. Foals in Western Canada and the Northwestern United States are most susceptible to congenital hypothyroidism. While the thyroid is developing in the womb, this disease decreases its function. Congenital hypothyroidism often results in foal deaths. Typically, signs of the disease include a long gestation and an extremely difficult delivery. Despite the complete gestation, foals with hypothyroidism are born looking premature, with lax joints and tendons, poor muscles, contracted legs, a protruding lower jaw, umbilical hernias and / or silky hair coats. Congenital stationary night blindness (CSNB) is closely linked to the leopard spotting in Appaloosas. Researchers theorize that both the spotting pattern and the blindness correlate with a gene called TRPM1. This non-progressive condition prevents horses from seeing in the dark. If you have a horse with stationary night blindness, talk to your equine veterinarian about how to manage this condition to improve the life of your horse. The first symptom that your horse has HERDA, or hyperelastosis cutis, may be the appearance of saddle sores that don’t heal. American Quarter Horses are most likely to have this skin disease, which causes inner and outer layers of the skin to separate or split. Sometimes areas of skin tear off completely. The lesions in saddle areas may be severe enough to prevent you from riding the horse. Horses with HERDA are very easily injured, so they must be managed carefully. Horses with hyperkalemic periodic paralysis (HYPP) experience sudden bouts of paralysis. They may collapse or even die. Quarter Horses and their descendants are most likely to be afflicted by HYPP. Defects in the sodium channel gene, which controls muscle contractions, cause the paralytic attacks. Horses with HYPP are sensitive to potassium levels in their diet. Owners should talk to their equine veterinarian to plan a specific diet for these afflicted horses. Appaloosas, American Paint Horses, Quarter Horses, draft horses and warmbloods are the likeliest horses to suffer from PSSM. The disease is divided into type 1 and type 2. Symptoms include sweating, muscle stiffness, shifting lameness, a tense abdomen, flank tremors and an unwillingness to move. Owners usually notice these signs during initial training or after a lay-up period. Light exercise, such as short periods of walking or trotting, often brings on the symptoms. Talk to your equine veterinarian about how to manage this serious condition. 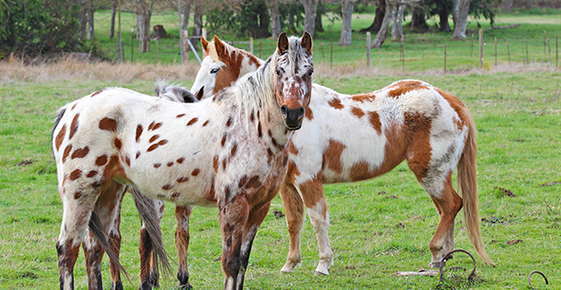 Quarter Horses and related breeds may suffer from GBED. Researchers estimate that GBED causes at least 3 percent of abortions in Quarter Horses. Foals born alive may initially appear healthy, but soon become extremely weak, develop seizures and die. Unfortunately, foals born with GBED die by 18 weeks of age. Congenital defects and disorders range widely. Some can be managed; others are fatal. If you’re worried that your horse may have a congenital defect, call us today, so we can help you determine the best course of action.